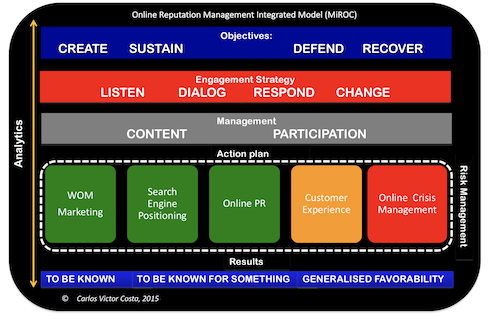 I developed and published in my doctoral thesis (2015) the Integral Model of Corporate Online Reputation Management – MiROC so that organisations can structure their plans to achieve four general objectives: a) create; b) maintain; c) defend and d) recover the reputation in the digital environment. Monitoring (or web analytics) is a transversal element of the model as it feeds the organisation with real-time information about users, relevant topics, competence and the level of engagement that is being generated with its stakeholders. Listening Strategy: it is the most basic level of action in the digital space, with little interaction, where the online presence occurs simply to extract information so the organisation can use it as another source of intelligence in their business plans. Dialogue strategy: it is when the company starts to move towards a dialogical relationship admitting the existence of the other (Internet users), but not necessarily assuming positions and making changes in their business behaviours. But, undoubtedly, the level of engagement is superior to the previous phase. Response Strategy: this level implies, from the dialogue with the interested parties, the openness to offer answers to the concerns of the users, in a level of dialogue more accentuated and, perhaps, risky, but these answers do not necessarily mean the acceptance of the proposals/ideas of the users. The answer can be both a “yes” and a resounding “no” to their requests, complaints, etc. Change Strategy: this level involves the co-creation of meaning and value between the company and the users. It is the highest level of engagement because it signals to users that the company is “embracing” collective intelligence and acting with users in the search for negotiated solutions. It is not easy because, basically, this strategy implies a almost a “partnership” between the organisation and its stakeholders. It is obvious that the strategy of Change is much more complex than that of Listening, since there is much more investment of resources from the part of the organisation (and from the stakeholders, as well). However, this definition is essential as it indicates how the organisation wants to achieve its objectives through its online reputation plan. The strategy is not necessarily for the whole company, it can be defined at the corporate or at the business unit/brand level. Therefore, there can be more than one digital strategy in an organisation (and this is more habitual, of course). From the moment you define what you want with the online presence qne how you are going to achieve that (the strategy), it is time to create the “foundation” of the online presence: content and participation management. Content management involves the use of the platforms available in the different digital domains according to the topology proposed by Donovan (2009). The company may decide to create static content, such as web pages, or create a dynamic presence on social media according to the strategy defined previously. Without this content it is not possible to “occupy” the web, and therefore it is commonly said that “content is king”. This is proprietary content (“owned”), not customer generated content (CGC). However, if content is king on the Internet, in the social web participation is the queen. Participation management refers to the protocols that must be followed by company’s representatives to act “live”, and a key part of this process is the work of the community managers and moderators. Participation activities are directly related to the conversational and relational system, and clear protocols are needed to establish behavior guidelines in the interactions with users. Viral marketing plan: It is related to the conversational and expository subsystems and includes digital word of mouth or buzz communication actions. It is the new advertising on the social web, which creates content that will be shared or mashed up by users. Very often, companies starts this “viralisation” with advertising / paid media to start the “contagious” process. Online user experience management plan: this plan is responsible for the interactions with users from the perspective of usability and interactions through representatives of the company in the digital environment. It is closely associated with the field of electronic commerce and customer service and corresponds to the relational subsystem. Online public relations plan: these are public relations activities aimed at influencers, such as certain bloggers of interest to the organisation, and who may or may not refer to an explicit action of paid advertising/sponsorship. This plan may contain actions that correspond to the conversational or expository subsystems. The fifth block of the model is related to online crisis management and online issues and risks. These are risks that challenge the conventional strategy of crisis management (Aula, 2010) and can be, for example, lies, half-truths, manipulated images, leakages, and also harassment, deceptions and ridicule (Fertik and Thompson, 2010). On the other hand, social media can be used to help in cases of crisis that do not occur on the Internet, as an additional element in the crisis communication plan (Wendling, Radisch and Jacobzone, 2013). It is a particular area of my interest, and was the subject of my previous blog (2011-2014) and the subject of my thesis. As we can see, several specific objectives can be defined by an organisation in its online reputation plan at strategic and tactical levels. However, I highlight that, in terms of reputation, the final results sought by the model are very clear: that an organisation is known, be known for something and obtain a general favourability – the pillars of any reputation program, digital or not.